On 15th February 2017, the ITTF successfully conducted it's very first IOC Athlete Career Program (ACP) in cooperation with The Adecco Group in New Delhi at the Seamaster 2017 ITTF World Tour India Open. World no.8 Vladimir Samsonov, and former Chair of the IOC Athletes Commission and Athens Olympic Games Silver medalist Claudia Bokel were the speakers of the two hour long workshop. Keeping in mind the goal of the Olympic Agenda 2020, the International Olympic Committee firmly places the athletes at the heart of the Olympic movement. 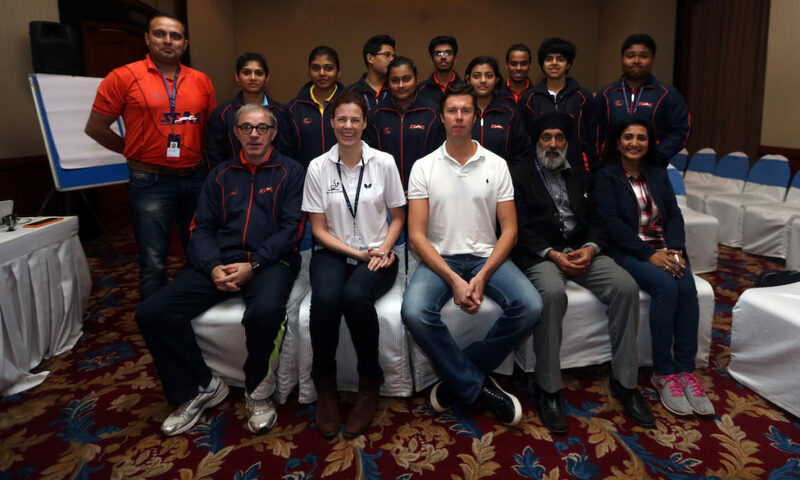 This thought was taken forward by the IOC and the ITTF at New Delhi with the launch of the very first interactive workshop of the IOC Athlete Career Programme (ACP) with the theme of Developing Lifelong Excellence. The workshop is solely aimed at educating the athletes on how to transition successfully in life after retirement from professional sport. The two day workshop is part of The Athlete Career Transition Programme, which was recently launched by Olympic Solidarity, which also offers financial and technical assistance to athletes through the National Olympic Committees. The workshop took off with a very inspiring introduction by Claudia Bokel who explained the agenda for the day. She emphasized the that the IOC Athletes’ Commission represents all the athletes and that it focuses on many projects to support the athletes in their life on and off the sports arena. One such program is the Athlete Career Transition Programme which aims to assist the athletes to make a successful transition to work life after retirement. Table tennis legend, world no.8 Vladimir Samsonov then took over. He encouraged the athletes to plan their life after retirement even while they are competing professionally. All the participants were distributed the Athlete Career Program booklet that contained several exercises based on this theme. The athletes engaged in many fun group activities to discover their hidden traits and interests. In one of the exercises, the participants were divided into three groups and each group was asked to write down the traits that they can possibly think of, an exercise that all the players enjoyed the most. Apart from that, there were exercises on recognizing personal values, personal traits, best practices for goal setting and developing one’s accomplishment story. “The exercises were a lot of fun and something I have done the first time. I got the opportunity to introspect and identify my own traits that I am sure I posses but was always unaware of. Understanding my own skill set, it will help to me to start taking interest in activities that I may pursue as a profession after I retire from playing table tennis,” said Birdie Boro, Indian table tennis player. “It was the first one for me and I enjoyed a lot. Everyone seemed to like what we spoke about. They wanted to win the small contest we conducted. It was wonderful to see the enthusiasm from all the participants,” said a rejoiced Samsonov. “I am always reluctant to come to Asia, because the people are a little shy. However, today was fantastic and I thank the athletes for participating,” she added. The first session was aimed to help the athletes understand more about who they are and what kind of traits they posses. In the second session, which will be conducted on 16th February, the focus will be on how the athletes can transfer their skills into business and work life. “Today was about who you are and learning about yourself, tomorrow’s session will be focused on effective tips on networking, the value approach to networking, CV/Resume building and building a vision statement.” explained Bokel. With sporting personalities like Vladimir Samsonov and Claudia Bokel sharing their own stories, the athletes left the room encouraged and determined. The second session will be conducted on Thursday 16th February 2017, from 12:00pm- 2:00pm at Eros Hotel, New Delhi.